Josephine Breaux is unique in her Washington, D.C. newspaper office. She is one of the few women working there, and the only one working as a reporter. She is smart and talented enough to get the best intelligence from both Union and Confederate troops. But her success doesn't last for long - a rival newspaper exposes her identity and she is soon questioned as a traitor to the Union. She gets a final chance from the Pinkerton Detective Agency and President Lincoln himself. They want her to flee to New Orleans, her home town, in disgrace and pretend that she had been a Southern sympathizer. As a reporter for the Crescent, she will write about the movements of Confederate troops (and then report them right back to the Union). When a familiar face from her childhood reappears, her carefully constructed story is in danger. Will she be exposed or can she continue to work as the crescent spy? I really enjoyed this unique Civil War story. Instead of focusing on the battles from the perspective of the men fighting, we see them from the eyes of civilian reporters trying to get the best information without getting killed in the process. It rung so true for Josephine and her colleagues to walk into situations full of bravado, only to quickly realize that their lives are in grave danger. 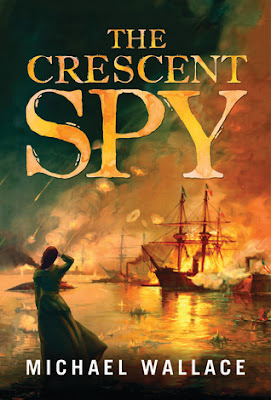 The Pinkerton Detective Agency has placed Josephine in New Orleans for two reasons - the first is to misdirect the people of the South through her newspaper articles and the second is to gather information about Fort Jackson, which may prove to be an entrance point for Union troops. Wallace really brings both New Orleans and the Civil War itself to life. He also maintains a very real sense of fear throughout the book since Josephine is in double danger, from her place on the sidelines of battles and the fact that she could be uncovered as a spy at any moment. Josephine herself is a wonderful character. She is independent and determined and will do whatever is necessary to get her story. Josephine has an interesting story herself, but it is one she does not share with anyone. She grew up on a riverboat with a mother who was a dancer. She isn't sure of the identity of her father and her upbringing was unconventional, to say the least. Josephine's flashbacks to her childhood give the reader a lot of insight into the choices that she makes in the present. 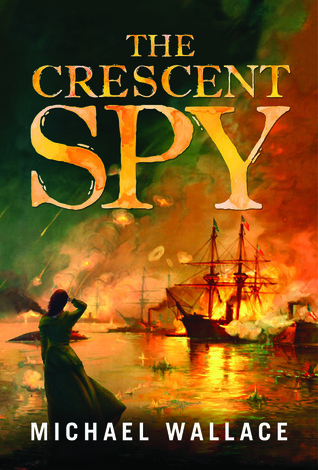 The Crescent Spy is great historical fiction that will keep you reading into the early morning hours as you follow Josephine on her adventures. Sound good, right? I have a copy to give away to one of you lucky readers! To enter the giveaway, leave me a comment telling me about your favorite historical fiction heroine. I will randomly pick a winner on Friday, November 20. I hadn't heard of this book but I'm intrigued! I'm always interested in books featuring newspaper reporters because I've got a journalism degree, and I can't resist historical fiction! P.S. My favorite historical fiction heroine is Lady Emily from Tasha Alexander's mysteries. But I have to say, Veronica Speedwell from Deanna Raybourn's new book "A Curious Beginning," which I'm reading now, is giving Lady Emily a run for her money! I'd go with Veronica Speedwell. New to me as well. I like Lady Julia from the Raybourn series. Historical fiction is my absolute favorite genre - I love discovering new things about history in the midst of a fabulous story!